I’m so pleased with this little project! 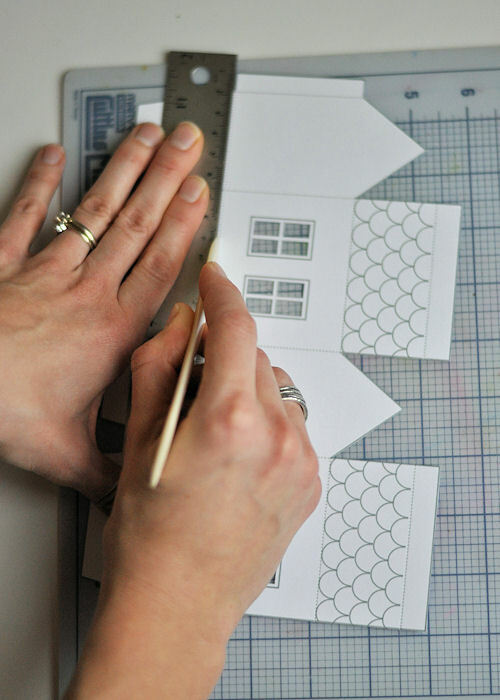 I collaborated with Jordan of Polkadot Prints to design a darling house-shaped gift box that is as easy as pie to put together. 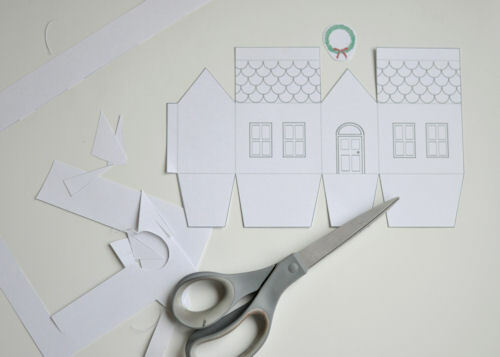 You’ll want to make one for neighbors, postal workers, teachers — pretty much everyone you know! 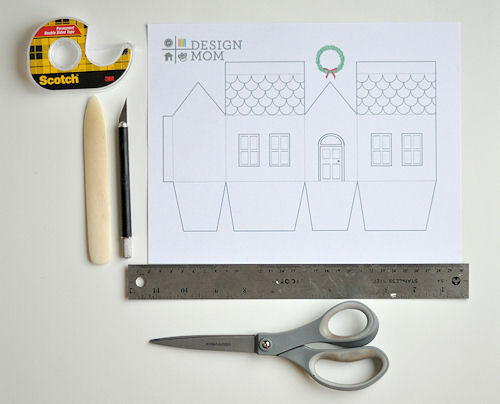 Simply print off the free template, cut it out and double-side tape it together. Fill your house gift boxes with a few small treats and your gift-giving list is done in a flash! 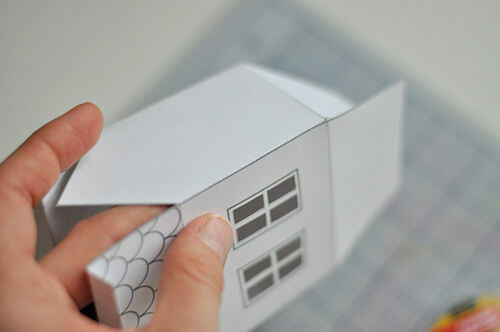 Print the house gift box template. 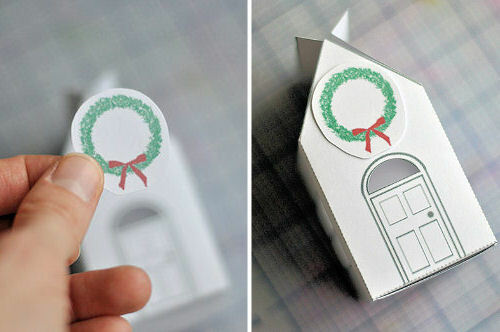 Cut out the house and wreath. 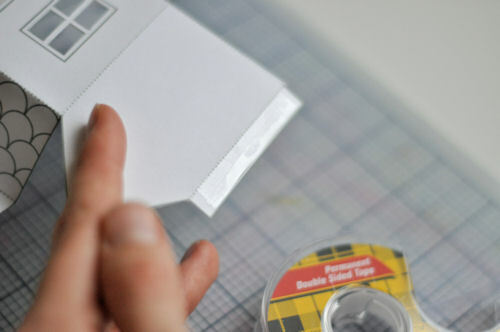 Add a piece of double-sided tape to the small tab. Add a piece of tape to the backside of the wreath and stick it in place. Fill the house gift boxes with a few small treats or a small gift. Add one more piece of tape to the top flaps and pinch the roof closed. – Teachers, delivery persons, newspaper delivery person, neighbors…the list goes on! – Schoolmates! They are the perfect size for little hands. Those are adorable!!! I want to make them to play with myself! Kinda reminds me of Made by Joel crafts, but I like how this feels more personal and cozy. You totally inspired me today! PERFECT and totally in time for teacher gifts. Oh, these are lovely, lovely, lovely. Thanks so much for the easy template! So cute! I need to remind myself to make these as an advent calender next year! This couldn’t be more perfect timing. Milo’s last day of pre-school before Christmas is tomorrow and I’ve been stumped about little teacher gifts! I’m printing these right now, filling them with Lindt chocolates, and saying “Merry Christmas” Design-Mom-Style! Fabulous..printing this off for friends of my kiddos. How sweet! These are truly lovely! I love the commenters advent calendar idea above. Thank you for sharing this…so sweet! I saw this on Pinterest today – thanks so much for sharing – it’s precious! I love this! I was just pondering what to bring to a Christmas party tonight–this is perfect. Thank you! So cute! And the perfect size for the milk man and the post woman! I am thrilled that my laser printer cold print on heavier card stock to make these boxes! I don’t have a scoring tool, but I have an old tool for transferring sewing patterns that worked like a charm. (A spiked wheel that you run along the paper.) I plan to bake biscotti this weekend and give them away in these boxes! I’d love to scale it larger and take it to the printer to make larger boxes too. Thank you for inspiring me. I would love to see this larger as well. More room for treats! Thank you very much for the easy template! I would love to use this free template, but when I click on the link it leads me to a black page?!? Can I access the template somewhere else? IT’s so cute, I’m desperate to use it. Please help. Thanks. I did email you the template. I hope it worked for you! I will send the template to you in the email address you entered for the comment. Hope that helps!! I sent the template to you too Salem! I sent it to the email you entered. Hope it helps! Is it possible to get it sent to my email? Twas a Success!!! 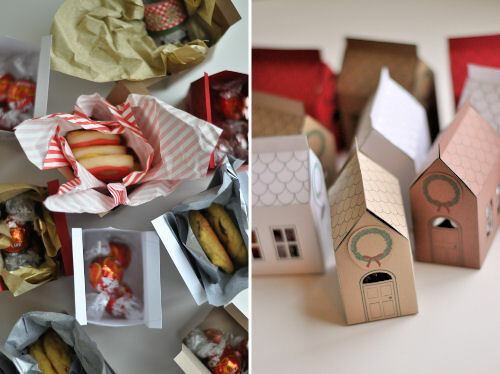 Everyone loved the little gift box houses! Now making them for our Christmas dinner for the guest! LOVE, LOVE, LOVE!!!! And a BIG THANK YOU for helping put a sparkle in my Christmas spirit! how adorable are these? thanks for the free printable! LOVE this! The template is adorable. Thank you so much. I am going to use them as a craft for my daughter’s 3rd birthday. Instead of the wreath, I punched out a circle that says “Grace’s House”. I put one together on pink cardstock as a test to see if it would strike her interest. She loved it. She got her stickers and markers out right away and decorated it. Grace’s party is next weekend. I will take pictures! What a cute idea! I’d love to see pictures! What a wonderful idea!!!! Thank you! Thank you so much for sharing this template, great gift box. Thank you for sharing the template, what a great gift box, so cute. Adorable!!! Thanks so much…will make good use out of this! 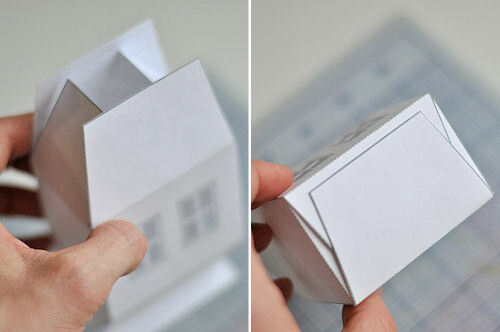 Awww this is taking me back to my high school years when I used to borrow a lot of origami books from the library and create different boxes, pop-up greeting cards, etc. Have not done any of it in the last 10 years! What a fabulous and adorable little house…thank you so much for sharing and the free template…gorgeous. This is a gorgeous design – thank you so much for sharing. I can’t wait to make one. to save your files and what file type you want to save it as. the list of radio stations you are listening to are all automatically updated. on is to make sure the audio quality is excellent on any spot your produce. Merci pour le partage …. idée mignonne pour les cadeaux …. so cute and easy.good idea for a little gift. thanks for sharing. I ll take note for a future post. and for sure I ll pin it. My daughters have a lot of non-Christians in their class at school, so these will fit the bill perfectly for a winter-themed gift (versus a Christmas present). Can’t wait to start crafting them! thanks for this gorgeous printable. we made these and gifted to my son’s kindy class today. we filled with biscuits that we made. 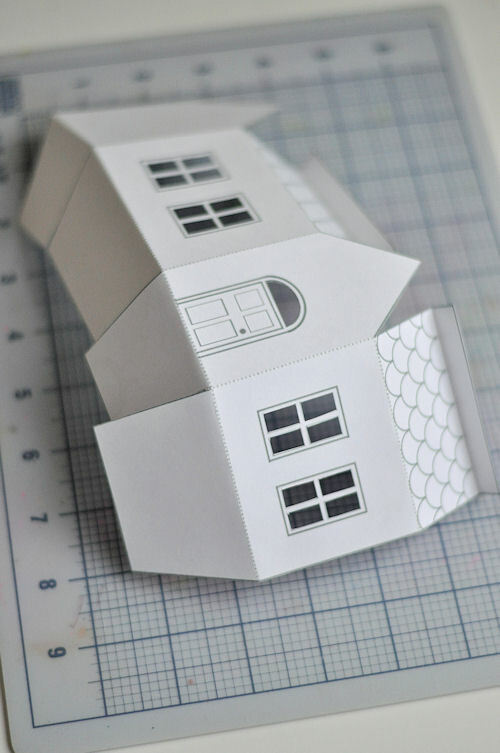 I did a blog post and linked it back to your printable as the houses were a big hit! Thank you very much for these great ideas! 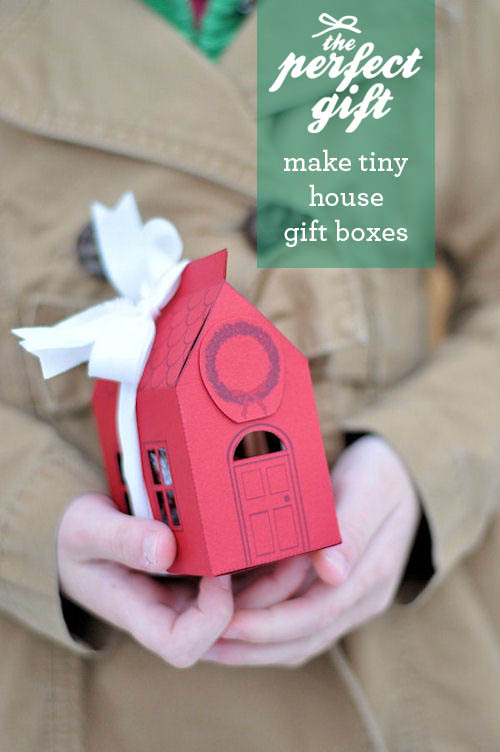 love these little buildings and they do make a great gift box. Thank you so much for sharing. I love your template! I am planning on making several hundred to give out as gifts to our volunteers and donors. I have to thank you so much!! Here recently, I’ve gotten into decorating gifts. Monsters was the first things I got into. They were awesome, but, my son had to go to a party for a boy turning 6. He got the boy a Hot Wheels set. 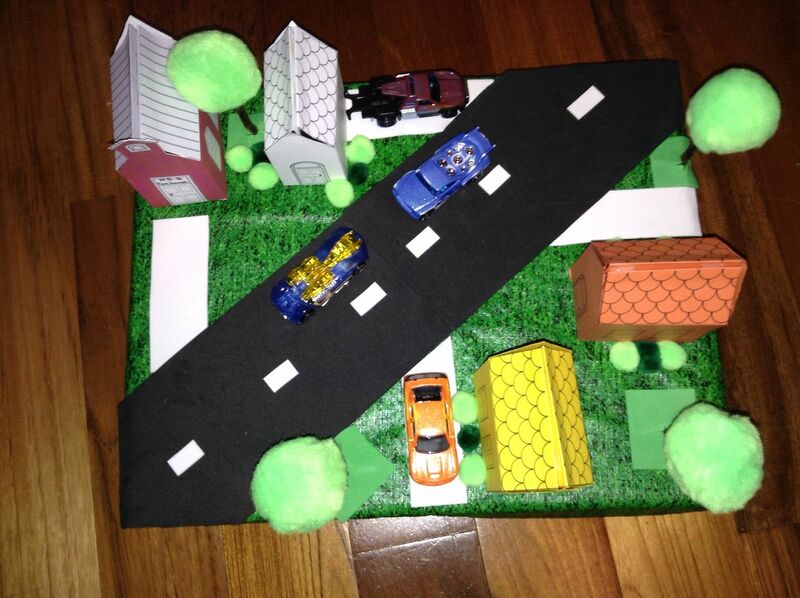 At first I was just going to do a road with extra cars stuck to it like I’d seen on Pinterest. But, then I was browsing paper crafts and it dawned on me. I’ve used printable boxes for treats in the past. Why not see if there were some sort of little houses and that’s when I stumbled onto your blog. And the houses were the perfect size to put extra hot wheels into. The gift grew from there till there was even a firehouse! (Firehouse was actually one of your school boxes done in red!) it even had a fire truck inside. It turned out so awesome that the party place thought it was a decoration! The boy loved his gift. Thanks for making Hot Wheels turn into a special gift! :) The website is actually a link to a pic on my photobucket so you can see it if you’d like. The pic doesn’t do it justice, but, it’s adorable! Thank you so much for the printables! 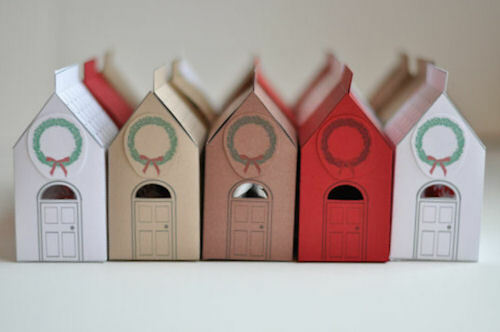 What great little house boxes! Thank you so much for these wonderful boxes – the template and your pics will be placed in a very safe place so I can use them year after year! Calendrier de l’Avent, à fabriquer en papier ! | ZOU ! 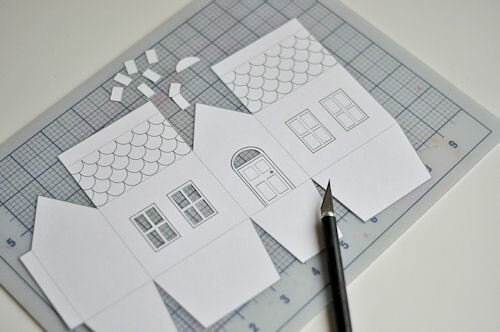 wooow i love it , these small houses are sooo cute ,, mmm i have a question is it made from A4 papers ??? Wonderful project! I made these little house boxes for my kids’ kindergartenmates and we brought them this morning. Without knowing what’s inside, the children were already happy to hold them in their hands. Their smiles were pure delight to me. This is indeed the perfect gift. Thank you very much for sharing! Joyeux Noël et bonnes fêtes de fin d’année ! Thank you for sharing the template. You made a good tutorial. I love this. Hallo! I’d like to use your template to make cake boxes for my wedding guest. But I need to print template on paper size A3 (42cmx29,7cm). I’m worried about quality. Can I increase the size to my paper dimensions? Thanks for your help!